If you are heading into the city to attend a performance at the Arts Centre or just visiting - head to Imaginary Architecture. Kate and her little ones let their imagination go beyond boxes and saw so much more during this exploratory activity. Art Centre Melbourne’s family-fun summertime program includes two FREE events that will inspire families to interact, connect and discover together. The ‘sheep’ of CORPUS - Les Moutons will take up residence on the Arts Centre Melbourne Lawn from Thursday 19th to Sunday 22nd of January. Lara Tumak’s Imaginary Architecture is calling on architects extraordinaire to build a mega mini city entirely from recycled materials from Wednesday 4th to Sunday 15th of January. Does your little one love to build and create things? Lara Tumak’s Imaginary Architecture is calling on all town planners, master builders and architects extraordinaire to come together and create a mega mini city for all to explore. Created by Lara Tumak, a Melbourne-based artist who enjoys thinking outside the box and transforming ordinary materials into extraordinary things. Imaginary Architecture is part of a larger body of work titled Before I Fell Asleep supported by the Australia Council for the Arts, Arts Victoria, City of Melbourne, CultureLAB ArtsHouse, Arena Theatre and ArtPlay. 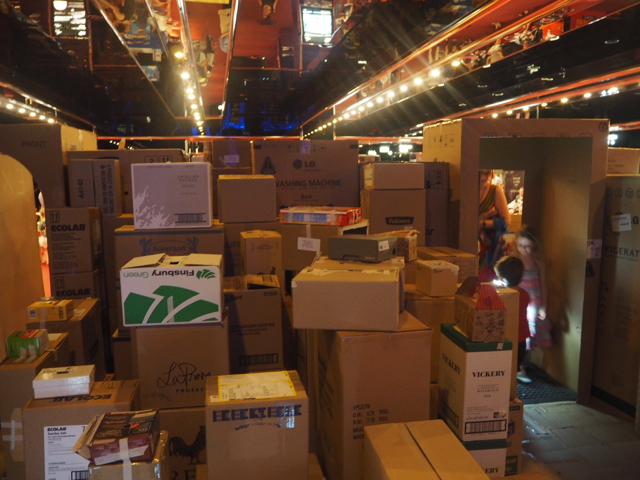 Separated into two areas – a cardboard mini city and making tables – we began our journey at the cardboard mini city where we were given a small torch upon entry to use to peer into the interiors of boxes. Each box is filled with a unique, handmade diorama that comes to life with your torch. We found cityscapes, fairy castles, stars, animals, people and several avant-garde creations (proudly made by little artists), plus I even spotted Mount Fuji and the famous Red Tori Gate! Once we were done exploring we made our way over to the making tables and with a lot of help from Grandma and Mumma, we made two dioramas to add to the collection! The making tables are filled with an assortment of coloured pencils, paddle pop sticks, sticky tape, colourful paper and string. You are encouraged to BYO an empty box (cereal, teabag or biscuit) but there is also boxes available. Although Arlo and Macy were too young to understand the concept, they still enjoyed peering into the boxes and colouring and sticking at the making tables (which were just a bit too high for under 5’s, with no seating provided). I feel that children aged 3/4+ would get more out of this event as they would be able to use their imagination and unleash ideas to create their very own masterpiece. Imaginary Architecture at Arts Centre Melbourne is a fun space to explore and play (especially before or after a performance of Room on the Broom - read our review here). It’s a very clever concept with unlimited possibilities for creative little minds. Imaginary Architecture is on now until Sunday 15th of January at the Arts Centre Melbourne in the Smorgon Family Plaza. For more info, checkout their dedicated website.